I have a sort of confession before I carry on with this review. The E-Stim Connect system is not entirely new to me. I was asked by E-Stim Systems to be a beta tester for it and I had so much fun trying it out and giving them my feedback about this new solution to the problem of setting up a remote session. I cannot underestimate just how chuffed I was when asked if I would provide some feedback about it and it was a good excuse (as if I needed any) for some more E-Stim Fun. E-Stim Connect is a software solution to controlling a 2B remotely, and it has two parts. Firstly you can download a free piece of software from the E-Stim Connect Website, it is available for PC, Mac and Linux (the Linux one is available but not supported). You use this little program to connect to your 2B, set some safety controls and initiate a session. The second part is the clever bit, and that is the server run by E-Stim Systems, this facilitates the session by allowing someone to connect to your 2B through an extremely simple and easy to use browser-based interface. The best bit, is that all of this is completely free! Yes, you heard that right E-Stim Connect is 100% free to use. You will, of course, need a 2B control box (Read my review of the 2B E-Stim Control Box), and you will also need a 2B Digital Link Interface Cable. You can buy these separately but it is included in the 2B Accessories Pack and the 2B Connect Pack if you are looking to buy a 2B. Anyone who already has the 2B Digital Link Cable and 2B Control Box is already in a position to have some remote fun, just download and install the client, and you are ready to go. It is just so simple to use, the website features full help files, but you probably won't need them as it is very intuitive. E-Stim Systems have gone to great lengths to produce something that works well on its release. The person being 'driven', often called the 'bottom' sets up their 2B Control Box and connects and fits their electrodes to themselves and the 2B in the positions that work best for them. Then just connect the 2B to your PC/Mac using the 2B Digital Link Cable. Switch on the 2B and fire up the E-Stim Connect icon on their desktop to open up the client-side software. You then select the COM port that is assigned to the 2B, if you don't know what that is you can use the easy "Find 2B" link which is under the "File" heading in the menu at the top of the program's window. You can also quickly press "Ctrl + F" on your keyboard to start the search. Once you have the right COM port, you can click on the Connect Button to initiate a session. This will generate a unique 16 digit alpha-numerical code that is valid for four hours. You can click on this 16 digit code to copy a link. You then need to send this link via e-mail, skype or whatever to the 'Driver' or 'Top'. This interface also shows the current firmware number of the 2B and the battery power level. When they get the link they can click it to go to the E-Stim Connect website to connect to the session, the 16 digit code is pre-entered for them into the form, and they just need to click the Connect button to start the session. When they do so, the 'drivers' window shows 'connected' so that they know that their 2B is now controlled remotely. The 'Drivers' interface is stunning in its simplicity, and through it, you can access any of the programs of the 2B and change settings quickly and effectively. As settings change, they are displayed on the 2B's screen so the 'bottom' can see the settings. The 'Driver' can use any machine with internet connection and a browser to control the 2B, so you can use your computer, tablet or even yur phone for remote sessions and this is fantastic. Obviously, handing over control on an e-stim control box can be a daunting thought so why would you do that? Well for the kick that being driven from afar can generate. But with someone else at the controls, you need to be sure that your limits will be respected and E-Stim Systems have thought of this. Through the client-side software, you can set limits to the power settings or even prevent the 'driver' from being able to change the program on the 2B. When programs are changed, or the stop button is pressed by the 'driver' the power levels automatically drop to zero. This is important, and it will encourage more people to let others stim them remotely, and that can be a lot of fun. When being driven, you can disconnect at anytime if you need to by simply clicking on the Disconnect Button. 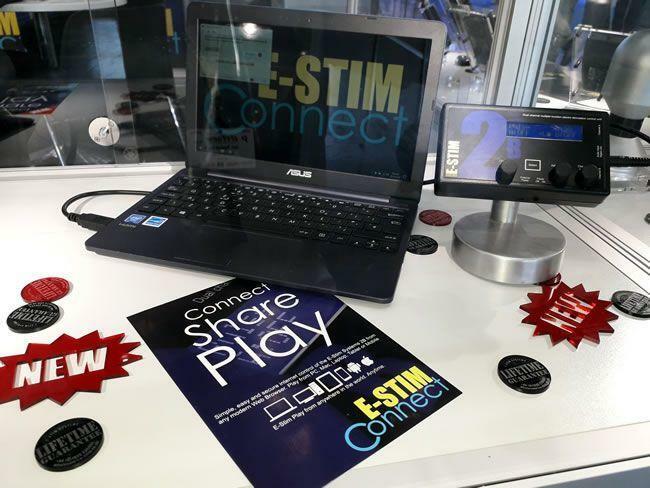 Currently, the E-Stim Connect isn't featured on the E-Stim website, and that is because they have been busy spreading the good word about E-Stim at Erofame in Hamburg. I expect the 2B products descriptions to be updated when they are safely back in Blighty and back at their desks. The Connect, Share and Play 2B Set is going to be a best seller as it allows simple long distance fun and games using the E-Stim Connect system. You will get a 2B and the Digital link cable and software in the pack and it will be ideal for anyone looking to get into remote e-stim play or even just having it as an option. The E-Stim Connect demonstrates a couple of reasons why owning a 2B Control Box is such a good idea. Firstly it is, in my opinion, the best control box on the market with its features and small form. Secondly, the firmware is updateable and always in active development. You can update the firmware yourself, and it is definitely a living thing, not like other manufacturers who are not actively developing their products. 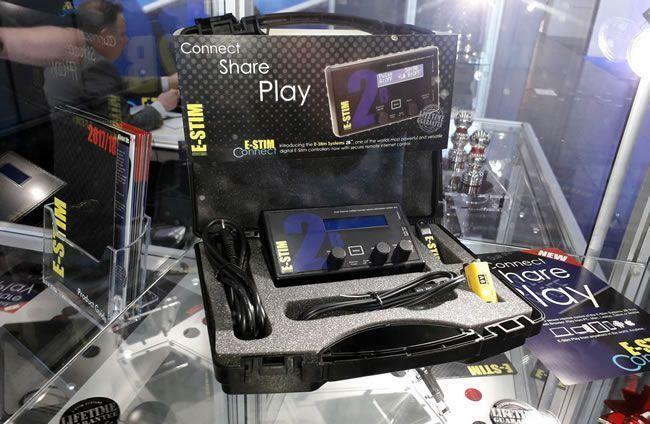 E-Stim Systems are continually improving the performance and features of the 2B. Thirdly, with the release of the FREE E-Stim Connect system, E-Stim Systems are again demonstrating their commitment to their customers over the long term. Buying a 2B makes you part of a community, and that is great. Finally, with their excellent customer service and support coupled with their lifetime guarantee, why wouldn't you want to own and enjoy the best Control Box in the world? I know I am delighted with mine. Try the new E-Stim Connect system for yourself to see just how easy it is to use and look out for the latest firmware on the E-Stim Systems Forum to bring your 2B upto date with the latest features. Visit the E-Stim Connect Website to get started. I loved experiencing E-Stim Connect and I would like to thank E-Stim Systems for giving me the opportunity to review it for them. It's great news that E-Stim Systems have now launched a 2B pack with everything that you need to start remote stimming. It includes the legendary 2B Control Box (Read my review of the 2B Control Box here), a Digital Link Interface and the Commander and E-Stim Connect software. It's a great way to get into remote stimming.